Genuine British Army Surplus PLEASE NOTE - THE 160/96 SIZE SMOCK HAS HAD THE WIRE REMOVED..
Genuine British Military Issue DPM Woodland Camouflage. Grade 1 - Very Good Condition - Issu..
British Military Issue Genuine Army Surplus. DPM Woodland Camouflage. 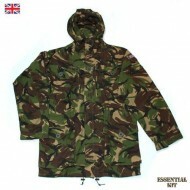 In excellent Super G..
Label States - TROUSER, COMBAT, Lightweight, Woodland DP.